PROTECT PALISADES BLUFFS! | Two proposed 49-unit apartment complexes within 90 yards of each other require the Palisades community to get involved! The 16990-17000 Sunset Project was APPROVED by City of LA Zoning Administrator on October 2, 2014 – appeals are being filed!! PLEASE EMAIL MIKE BONIN (councilmember.bonin@lacity.org) to express your disappointment!! 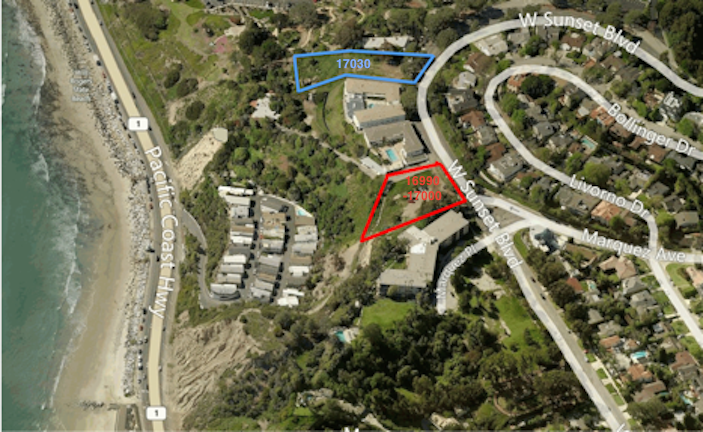 Approval of these 2 projects will create a strong nonconforming development precedent that will dilute the authority of current regulation and make future nonconforming projects in Pacific Palisades more likely to be approved. These projects need much stricter scrutiny. They are far too dense for the community. Would it be possible for a citizens group to purchase the property for a conservation project. The citizens could fund it and the government could use its mighty awesome power to please its tax base and eminent domain the bluffs for the good of the people. The property is presently being used as a dumping area for building materials with unknown substances and perhaps they are harmful. Why would the government support a project that is contrary to law and disregard the will of the entire community?